Tuto Mazara, India. 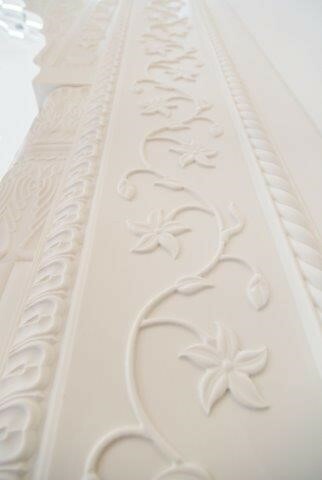 The interior wall cladding of the town’s temple extension project has been made entirely with Corian®. The solid surface is used for creating various decorative effects as well as for its superior acoustic properties; interior project Mr. P. J. Singh from Singh Modelers; photo Corian®, all right reserved. Home to followers of four of the world’s major religions, India boasts an impressive collection of sacred architecture, from towering Hindu temples to Mughal-style mosques. While most of these are centuries-old structures made with traditional building techniques, there are recent works of religious architecture in the country that look to modern construction materials, most notably Corian® solid surface, to create innovative designs. One such example may be seen in the town of Tuto Mazara in the northern state of Punjab. Here, the local Sikh community looked to renovate the town’s temple, the gathering place where Sikhs traditionally come together for congregational worship. Originally completed in 2011, the congregation of the Kutia Tapstan temple in Tuto Mazara decided to add an extension to the existing building to better accommodate locals participating in the religious ceremonies and community events inside the temple. 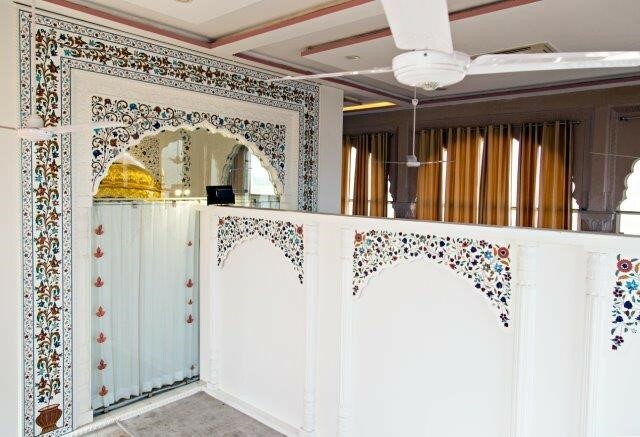 Eager to experiment with new techniques, Project Designer Mr. P. J. Singh, who oversaw the renovation work, decided to use Corian® as a key component in the remodelling of the temple. The plans called for the innovative solid surface to be used as interior wall cladding – sections of Corian® also feature on the exterior of the temple – together with carved natural stone and mother-of-pearl inlay, techniques that enjoy a long tradition in India. Floral motifs made from natural stone and wall cladding with patterns in Corian® Glacier White; interior project Mr. P. J. Singh from Singh Modelers; photo Corian®, all right reserved. Given that the interior of the temple would see a high volume of traffic each day, it was important to find a building material that would be easy to clean and maintain in good condition over time. What’s more, Sikh practitioners typically sing hymns during religious services at the temple so it was essential that the new space have excellent acoustics. The selection of Corian® helped to overcome these challenges. 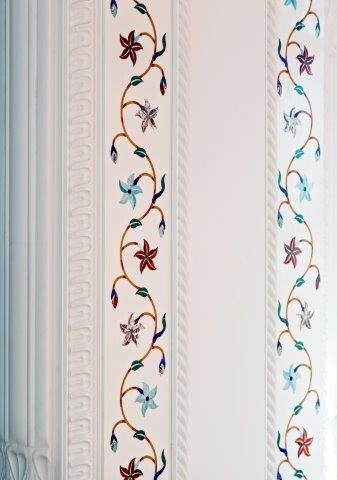 The advanced surface was chosen over marble, a stone that is traditionally used in religious architecture – for example, the decorative marble inlay seen at the Taj Mahal in Agra. The team working on the Kutia Tapstan temple in Tuto Mazara preferred to use Corian® since marble inlay work is time-consuming and because of the porosity of marble. Singh’s plans called for over 3,000 square feet of surface to be clad with Corian®Glacier White, which was used together with Agra Red sandstone and mother-of-pearl inlay on the walls in the hall of the temple. 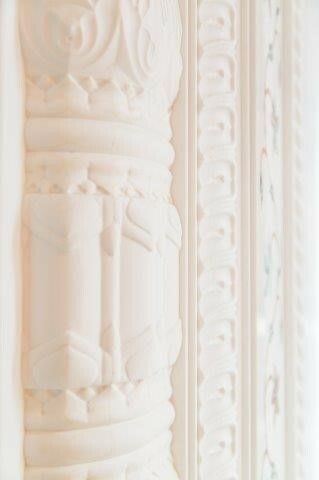 Components in Glacier White featured carved patterns that resembled floral motifs that were designed by the architect and which drew inspiration from religious texts. As it is customary for men and women to sit separately in the hall of a temple during prayer and meditation, a partition in Corian® Glacier White was conceived by Singh that included carved floral patterns and partly embedded columns. 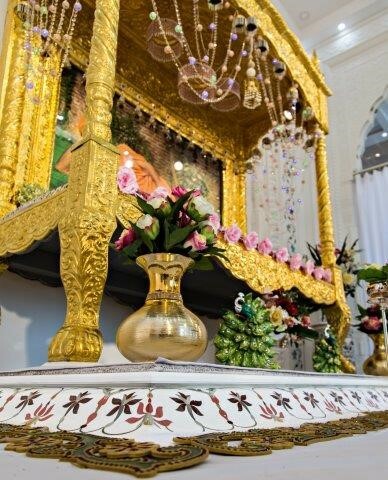 Upon completion of the project in 2016, the Sikh members involved with the day-to-day running of the Tuto Mazara temple were impressed with how Corian® solid surface met the congregation’s needs. Known for its subtle textural effects, the material was the perfect fit for the architectural brief: to create a welcoming atmosphere that resonates purity and serenity without becoming overly distracting to the faithful who come to pray and meditate. To ensure renovation work respected the timeframe laid out by the committee overseeing the Tuto Mazara temple, the architect turned to Oystra Concepts, a respected Corian® Quality Network Fabricator that completed the job in 9 months. The Noida-based interiors & furniture business has made a name for itself redefining spaces with its new-age designs. To create the ornate carvings in Corian®envisioned by Singh, Oystra Concepts imported a special 3D thermoforming machine from Germany. The staff of Oystra Concepts underwent special training in order to realize the intricate shapes on the Corian® solid surface. Their precise work mirrors the dedication of Indian craftsmen who have worked for generations to carve natural stone and execute mother-of-pearl inlay. Together the three building elements were combined into an attractive cladding. “The project is successful on two fronts. First, the design delivers a soothing space where worshippers share an uplifting experience. This is thanks to the choice of materials employed by the architect. In addition, the ability to recreate traditional architectural motifs by using an innovative material such as Corian® provides an important link between tradition and modernity” says Sambhav Jain owner of Oystra Concepts Pvt Ltd. Classic designs re-elaborated with new technologies communicate with the next generation and help to diffuse the rich heritage of India’s religious architecture.